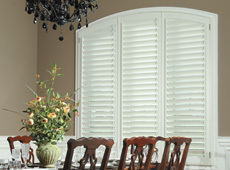 Working with our customers, we can design just the right shutter for practically any window, including arches, eyebrows, half-round, angular raketops, doors and more, and with a wide range of options, such as accordions, midrails, and massive panels up to 50" x 130".. It is not well known, but when a home is being built, slight variations may exist between seemingly identical window openings. 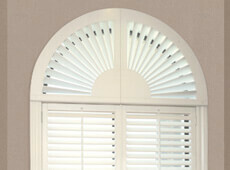 We precisely measure each individual opening and design your shutters for just the right fit. This also includes arched and angular windows. We do not cover your existing trim or simply attach hinges to the jamb, but integrate them into the existing architecture as a unit, providing the look of master planning. Working with our customers, we can design just the right shutter for practically any window, including arches, eyebrows, half-round, angular raketops, doors and more, and with a wide range of options, such as accordions, midrails, and massive panels up to 50" x 130". Traditional rectangular panel, in standard and accordion designs. 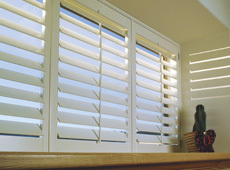 Curve-top panels with fully synchronized louver control. Fully synchronized, quarter-round sections for the top of rectangular panels. 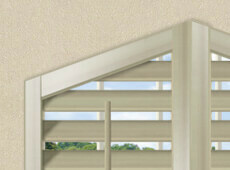 Custom-designed shutters for openings having an angled top. Door-mounted designs with full access to door handles and locks. We offer an impressive range of configurations and styles, with custom designs for any opening or door, with a level of fit and finish for a smooth architectural and stylistic integration into your décor.